The main reasons why people opt for used cars is the affordability while also being able to have a vehicle of one’s own which has become quite a necessity these days. Smaller cities like Jaipur rely on personal modes of transport since public transport system is not as well developed. Sometimes used cars also serve as a secondary vehicle while a car owner might already have one. Whatever the reason might be, the purchase to be made must be well-researched and inspected. Below are some affordable pre-owned cars under 3 lakhs in Jaipur that you can check out and know about their features and performance in their newest conditions. Competing well with its rivals in the entry-level segment is the Hyundai car manufacturer. Offering state of the art designs and features, Hyundai has made a name for itself in the Indian automobile market. Over the years, they have come up with several upmarket models having given impressive upgrades to their subsequent editions for every model including attractive limited edition sports models with various changes in style. The Hyundai Eon Magna has a very compact and fluid design and has attracted many budget buyers receiving an overwhelming response. Even its rival makes from other brands in a similar range fall short in terms of the overall design theme including a hexagonal grille and wraparound headlamps. 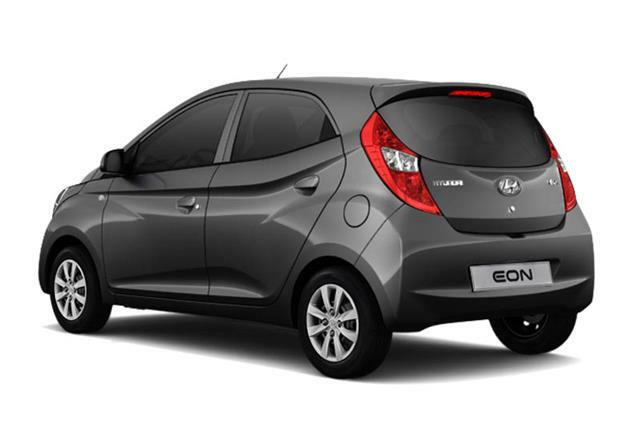 Colour options for the Hyundai Eon Magna include Sleek Silver, Fiery Red, Polar White, Pristine Blue and Star Dust. The overall finish is excellent with a black and beige colour scheme comparable to its contemporaries which is commendable because Hyundai takes good care to make its cars visually appealing, even if it is a small low budget hatchback. While purchasing second hand cars in Jaipur, the Magna Eon makes a good choice. > The car comes with two engine options which include the lower variant powered by an 814cc 3-cylinder petrol engine. This is capable of producing 55PS with 75Nm torque. > The more powerful variant of the Hyundai Eon Magna engine is the 1.0L that pumps 69PS and 94Nm peak torque. Both engines are paired with a 5-speed manual transmission. > Overall engine performance is impressive with a smoothly synchronized gearbox having completely transformed the driving feel. > The mileage of a new car is estimated to give a fuel economy of 21.1 kmpl for the lower capacity engine variant. The higher 1.0L engine gives an efficiency of 20.3 kmpl which although lower gives an impressive mileage. > The interiors of the Hyundai Eon Magna are visually appealing as the quality of upholstery and fabric usage in door trims are good. > For comfortable and spacious seating, The Eon Magna can seat 4 people but can squeeze in 5 in all. In addition to the seating, there is ample boot space to hold a decent amount of family luggage for a weekend trip. > In terms of exterior looks in the hatchback range, the Hyundai Magna Eon definitely scores high. Notable features include its grille and bumper at the front with aggressive design lines also found in other makes of this brand. > Large pulled back headlamps on either side of the bumper gives a fine finishing touch to an overall sporty look. Looked at from the side, it can be easily mistaken for the Hyundai i10. Half-moon shaped tailgate lights complete the look. > The sports edition of the car comes with an additional body moulding graphics and roof rails giving it an extra edge. > Braking capability of the Eon Magna will take its users by surprise given its very good bite force enabling the car to halt without any fuss or side movements. > A reinforced body structure minimizes a force impact. Driver airbags, engine immobilizer, central locking, front fog lamps, child safety rear door locks and remote keyless entry include standard additional safety features. > Although a little unpredictable on the highways, the suspension is well-tuned for city driving and promises a good ride quality to its passengers and unlike the older variants like Santro, the Hyundai Eon Magna has definitely been able to upgrade itself. Known for its urbane and classy sedans, Honda has been a very successful automaker in the Indian market. Since its inception in the year 1998, the carmaker has upgraded and come up with better cars, better features promising more and delivering up to expectations making it a trusted car brand. The Japanese carmaker is best known for the Honda City that has been around for more than a decade ever since its first launch. Overall, the carmaker has been able to keep up its standards and is appreciated by car owners offering an aerodynamic design and high build quality. The same aura of the original Honda City remains as it has upgraded itself with better features in the newer versions. Honda City comes in various colour options ranging from White Orchid Pearl, Carnelian Red, Modern Steel Metallic, Alabaster Silver and the Golden Brown Metallic. Pre-owned cars in Jaipur can be found in varying levels of usage conditions and can be surveyed in detail before choosing the desired seller. > The engine variants for the Honda City include a 1.5L i-VTEC petrol engine capable of a power output of 119PS and a peak torque of 145Nm. It is paired with a 5-speed manual gearbox as standard. Upgraded options offer CVT automatic with paddle shifters. > The diesel engine variant is a 1.5L i-DTEC capable of generating 100PS and 200Nm maximum torque. The engine is paired with a 6-speed manual transmission. > Well known for its fuel efficiency, the Honda City in its newest form offers a reliable average mileage of 25.6 kmpl for the diesel variant while the petrol powered variant satisfactorily performs at 17.4 kmpl. The automatic transmission car has a fuel economy of 18kmp. > Honda addresses the modern day connectivity issue with ample options to choose from. The Console features a 7-inch touchscreen unit called Digipad which offers WiFi connectivity, Mirror Link smartphone connectivity. Other features also include 2 USB slots, a 1.5 Gb onboard storage, 2 microSD card slots and the option for HDMI connectivity as well. > Adjustable driver’s seat, Auto AC with touch control panel, engine start-stop and the Honda Smart Key System add to its list of fine features. > The best features of the Honda City interiors have been retained, most notably a super spacious cabin with ample legroom for its passengers. The craftsmanship is excellent assuring comfort and elegance. > An ergonomically designed cockpit and rear AC vents give passengers a comfortable ride. > Interiors are finished with a black, beige and silver colour combination reducing the quality gap and giving it a very premium finish. > The steering wheel is mounted with audio controls for ease of adjustment while being on the perfect driving position. The sunroof too has a touch operated functionality. > The classy sedan has received several facelifts over the decade with more sporty finishes. The front features a chrome radiator grille with a honeycomb mesh behind. New LED DRLs and LED headlights are notable upgradations as well. 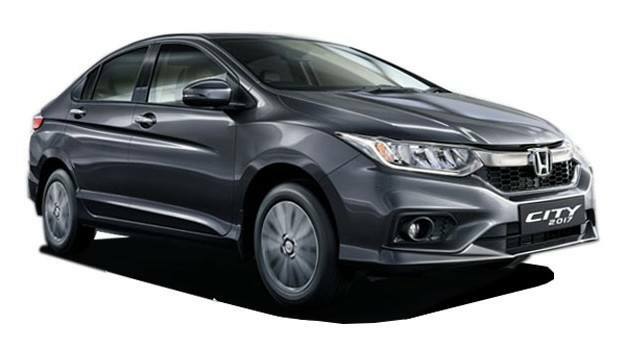 > The rear bumper with its black honeycomb insert gives a cleaner finish and the Honda City itself is an upsized version riding on a new set of wheels measuring 16 inches in diameter. LED lights are also present in the rear trunk spoiler and on the wing mirrors. The indicators give it a sharp finish. > Safety features include an ABS and EBD which is a standard feature across all its variants. Other than this, it also has dual front airbags, rain sensing wipers, auto headlamps, rear parking camera and auto-off timer. > Overall suspension of the Honda City assures great stability and comfort even under trying driving conditions and performs well on Indian roads, especially at high speeds when it is very steady. Another make from the reputed and stylish car maker Honda is the Honda Brio. The small car range by Honda has been one of the firsts in its range and even though it is best known for its range of affordable but super stylish and comfortable sedans, the hatchback segment to have gained some popularity in the Indian automobile market. Honda Brio was first launched in 2011 with Honda making its entry into the affordable range of hatchbacks. Although the basic shape has remained the same, upgrades have been made to the make since its first launch almost a decade back and the vehicle has witnessed some cosmetic changes and additions while the engine and transmission remain mostly unaltered. Glossy black radiator grille, a sleek bumper has been inspired from its higher priced make the Honda Amaze. New and updated features include slightly tweaked headlight and taillight designs along with new LED lights. Currently new Honda Brio cars are available in 5 different colours including Taffeta White, Rally Red, Alabaster Silver, Urban Titanium and White Orchid Pearl. > The car is powered by a 1.2L i-VTEC 4-cylinder petrol engine producing 88PS with 109 maximum torque. Both automatic and manual variants are available with the motor being paired to a 5 speed transmission. > The manual transmission offers somewhat crispy shifts while the automatic is definitely smooth and responsive. > Honda Brio claims a fuel efficiency of 18.5 kmpl for its petrol engine in the manual transmission and 16.5 kmpl for the automatic variant. > The interiors of the Honda Brio are more sophisticated in its newer versions with a very contemporary look and quality finish. > Color schemes include an all-black theme with dull silver highlights and a faux carbon fiber garnish that add to its sporty look. > The seats are skinny but comfortable. The short seat cushioning on the rear seats offer slightly low support but has decent legroom for its passengers. All windows are power windows with a foldable rear seat back. > Ergonomics of the Honda Brio is quite commendable with easy to reach and use knobs, switches to the AC controls – all within easy reach for the passengers. > In terms of the entertainment package, the Honda Brio comes packed with a 2DIN music system having Aux-in, Bluetooth and USB connectivity. Audio controls are present on the steering. It also has a MID display with blue illuminated rings for its newer models. > The exteriors of the Honda Brio have undergone little change in design since its first launch. The grille is similar to the Honda Amaze but has a glossy black one in comparison to the chrome one in Amaze. > The front is well-defined and has a faux air intake and two fog lamps on either side. The unique addition to the Honda Brio is the glass-hatch but it lacks a rear wiper. > Passenger safety comes with dual front airbags, an engine immobilizer and a rear windshield defogger. Brio comes with a disk brake in the front and drum at the rear. In high speeds, the > brakes perform well with a good grip and pedal bite. ABS and EBD features are also present for additional safety. > Overall suspension is quite good and the car performs well on Indian roads while drivers will find it very convenient while dealing with corners and narrow spaces. The light clutch and steering feels lovely on the hands and makes anoverall good buy. For those looking for a premium car in the hatchback category, Volkswagen Polo is the first offering of its kind in the Indian subcontinent. Volkswagen as a brand holds a significant value and brand name as a German carmaker in the Indian automobile portfolio. Despite its initial struggles, Volkswagen has managed to create a strong position gaining the trust of people giving intense competition to its rival car makers. The Polo has become one of the most widely purchased model under this brand owing to its unmatchable levels of sturdiness and finish. Over the years since its launch in 2010, the carmaker has upgraded its make wisely offering timely updates to interiors, exterior looks as well as its engines. The newer versions of the hatchback have been designed on the new MQB A0 platform as a result of which the new Polo is longer and wider. New design elements in terms of headlamps, LED tail lamps and redesigned dashboards, touchscreen infotainment systems etc. have been incorporated. A clean and minimalistic designed hatchback, the Polo guarantees durability and good performance. Handled with care, the car can give off great performance even in the used car segment. > The Volkswagen Polo comes in diesel and petrol variants. The Petrol is powered by a 1.0L engine paired with a 5-speed transmission gearbox in both manual and automatic forms. The TDI Diesel engine variant is powered by a 1.5L engine capable of producing a 90PS and 230Nm torque. Overall, it gives a great performance on city roads. The 4-cylinder turbocharged model is also available with a 105PS and 175 Nm torque power. > Folks who love a more powerful vehicle can opt for the GT TDI engine variant in the same model capable of producing 110PS and 250Nm torque. > Externally the Polo has a very sporty look and competes well with most rival hatchbacks with its modern looks. It does not compromise on its features and maturity either. The brand logo sits on the center with a thin silver grille. On either side sits sharp headlights but lacks LED headlights. > An aggressive appearance is imparted by the air dam below the sharp chrome lining. The lean design of the car can be best felt when viewed from and angle or the side giving off a very clean look neatly finished while it also scores well in cuteness when viewed from the rear owing to its adorable square shaped taillights. In motion, the 15-inch TOSA and 16-inch PORTAGO alloy wheels look excellent. > The cabin is somewhat spacious and can comfortably seat 2 and even 3 people at the back. The front is definitely more spacious and capable of competing with its rivals. > The interiors have a two-toned color scheme which gives it an elegant finish. > The Console has a silver finish angled towards the driver for easy adjustment. The bottom steering is also mounted with audio controls and has a leather wrapping with chrome highlights adding to its richness and premium feel. > The touchscreen infotainment system can be paired with one’s Apple or Android smartphones. It also supports MirrorLink that enables mirroring of the smartphone screen on the display screen. Music synchronization is possible using USB, Aux-In, Bluetooth or SD card. > Additional features include climatic air conditioning system with its own dedicated display and a large open space is present between the center console allowing passengers to stash spare items or other small belongings. > Special features include an auto-dimming interior rearview mirror, ambient lighting offering a theatre effect, driver side dead pedal, a sunglass holder inside the glovebox itself which is capable of being cooled through the air-cons present inside, one-touch up/down windows, rear wiper/washer etc. Some common equipment like navigation, reversing camera and keyless entry however are missing as can be found in rival cars of a similar style. > Standard safety features of the Volkswagen Polo include dual front airbags, anti-lock braking system, front and rear height adjustable head restraints, 3-point front and back seat belts, central locking, emergency exit, rear fog lamps and electronic engine immobilizer with a floating code. > The efficient ABS system enables drivers to control the amount of braking especially in heavy traffic situations, while shedding speed or entering tight corners. The strength of the steel frame and comfortably nestled seats assure ample safety. > Coming from a European car maker, the solid built assures good ride-quality and well-tuned suspension with mature road manners. The grip levels are great and comes with light but communicative steering wheels performing well even on the rough patches often found on Indian roads. Maruti as a brand has become synonymous as the family car brand. From the makes of Maruti 800 and then the upgraded Alto 800, the brand has always led the market in terms of affordability and performance. The entry level sedan from the Indo-Japanese duo is one of those cars you probably see most frequently on Indian roads. The leading player was first introduced in 2008 and has undergone many stylistic and internal design changes continually upgrading and keeping up with its rivals in the very competitive market. > The engines have a 1.2L petrol and diesel variant. The petrol engine is capable of producing 82bhp with a maximum torque of 113Nm while the diesel one produces 74bhp with a peak torque at 190Nm. Both are powered to a 5-speet manual or an AMT gearbox. > Reduced engine load in comparison to its previous models give the Dzire good fuel efficiency estimated at around 28.4 kmpl for the diesel and 22kmpl for petrol. > The newer models have a fresh interior design with the classic black and beige color scheme. 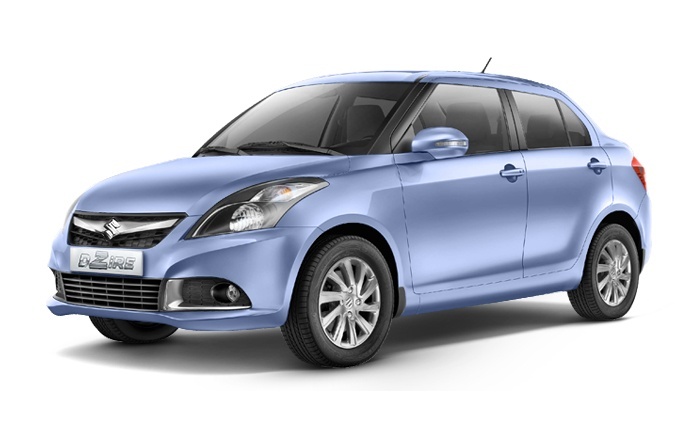 In terms of spaciousness, the Swift Dzire scores quite well. > The infotainment has a tilt angled towards the driver, a backlit instrument cluster and a chunky steering wheel completes the look. Ample cushioning and under-thigh support adds to the comfort while leaving room for seat height adjustment. > Center armrest, bottle holders at the doors, 2 cupholders, a 7-inch SmartPlay infotainment system which is touchscreen offers ample entertainment options. It offers Apple CarPlay or Android Auto connectivity including the standard USB, Aux-in and FM as well as MirrorLink. > The newer models have a seductive look which can be categorized into a proper sedan featuring a wide pouty grille with thick chrome lining, LED projector headlights and daytime running LEDs. The rear profile is simple and business-like with LED tail lamps, a wide derriere and wheel arches. > The braking system for safety features disc brakes in the front and drum at the rear. The performance is good and responsive. Other features include dual airbags, anti-lock braking system, electronic brake force distribution and brake assist. Rear defogger, front fog lamps, anti-theft security system, engine immobilizer and a speed sensitive lock door makes it a good competitor with its rivals in the similar price and feature segment. > Overall, the Swift Dzire performs very well on Indian roads absorbing small bumps and undulations without much hassle owing to its efficient suspension system.